College is a new and exciting experience for young adults. Throughout your four years we hope you will grow and mature into a well rounded individual. During your time here you will meet new and different people, make new friends and join in a variety of extra curricular or work opportunities. Along the way you will have challenges and successes, both of which will make you a stronger person. Stonehill thrives on educating the entire person, the whole being, mind, body and spirit. At the Office of Health and Wellness we offer information on how to live a healthy lifestyle and encourage making positive behavior choices. We believe in promoting the health and wellbeing of students through prevention of illness, injury and disease and through raising awareness of issues affecting the students mind, body and spirit. The Office of Health and Wellness is located in the Roche Dining Commons, Room 101. To register for a wellness training, sign on to Handshake and search for them under "workshop". If you would like to request a health related presentation please email Jessica at wellness@stonehill.edu. See “health topics” list for possible list of presentation topics. Professors, Resident Advisors or students interested in health and wellness issues may request presentations. We counsel on a variety of topics including but not limited to: basic nutrition/diet assessments, smoking cessation, sleep tips, stress and time management, sexual health questions or relationship/roommate tips. We also offer referrals to the Sodexho Dietitians x1879, the Counseling and Testing Center x1331 and Health Services x1307. We conduct workshops and seminars on a variety of topics including but not limited to: Healthy Eating and Stress Reduction and Relaxation Techniques. Our library contains a variety of books useful to college students on topics included but not limited to: Cooking, Eating Disorders, Alcohol, Feng Shui, Vegetarianism, Sports Nutrition, Nutritional Supplements, etc. In addition we also have a wide variety of pamphlets, brochures, handouts and other health literacy materials on numerous topics. Stop by today to see our selection! We help sponsor campus wide events which focus on specific health issues such as: Alcohol Awareness Week in October, the Great American Smoke Out in November, World AIDS Day in December, Eating Disorders Awareness Week in February, Safe Spring Break in March and Sexual Assault Prevention in April. If you are interested in learning more about these events or helping out with them please contact us, we’d love to hear from you! We are pleased to announce that Stonehill College has received the Jed Foundation Campus Seal of approval signifying that our campus is proactive in raising awareness and educating the community about mental health issues and suicide prevention. 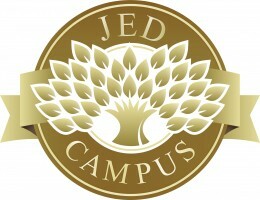 "The JedCampus seal will be awarded to schools that exhibit comprehensive mental health promotion and suicide prevention programming, based upon evaluation of the school’s survey responses against the Jed Foundation’s recommended practices in mental health programming. This recognition of your school’s commitment to the emotional wellbeing of your campus will remain valid for two years."